I’ve never been great at keeping New Year’s Resolutions. I’ve always tried, but either I make goals that are far too unreasonable, or I forget about them all together. So this year, I’m determined to be realistic and prayerful. This past year I read a devotional that has been such an encouragement to me. My former principal, Tonya Burns gave this book to all of the elementary teachers for our morning devotions at Calvary Christian School. Honestly, I was annoyed. This was my first year at the school. We had just moved to town, after living in Tennessee for nearly 10 years. I had to start all over creating lesson plans for a curriculum I had never taught. I was driving an hour each way to school since we hadn’t found a house and were living with my in-laws. I didn’t get home until about 5:30/5:45, and by the time I finished cooking dinner (or eating bologna sandwiches), helping my 9 year old with his school work, playing with my 3 year old, getting them in bed, and doing my work for my classes the next day, it was usually midnight or later. And here I was given another assignment? Homework?! Thankfully, the Lord knows the plans He has for me (Jer. 29:11), and He knew I needed just one more thing to do. I know you will read countless resolutions and ideas for the new year, and like me, you will probably just skim over or scroll through most of them, paying little attention to the content. But if you are a woman, a mom, a young lady who feels like you are stuck in a blender, watching life whirl around you, then stick with me for just a few minutes. She Did What She Could are the five words that Jesus spoke to the company visiting the house of Simon. His statement was in defense of Mary pouring the oil from her alabaster jar and anointing Jesus shortly before his death. She didn’t adhere to the rules of propriety for that day. She payed no attention to the criticism of the others. She was determined to do something for Jesus, something personal, to give him something that she had, something that meant a great deal to her. There were many things she could have done, but she did what she could, and Jesus exonerated her for it. Mark 14:9 states that…”wherever the gospel is proclaimed in the whole world, what she has done will be told in memory of her.” Wow. As women, we think we have to do everything…every-single-thing…by ourselves, with full make up on, looking like a perfect Pinterest mom. We think that if we can’t do it all, we are nothing, and we have failed. I have struggled (and still do) with this, especially over the last two years. We have been through crazy transitions, and my candle has been burning at both ends. Well, actually, my candle is a melted wad of wax, puddled on the floor by now. Honestly, I have no candle. As a result of this, I had a major wake-up call. It was the last day of school before Christmas Break, and I was driving home with my two boys. We were excited to start our Christmas vacation. I had been staying up until 1 am that week, trying to get lesson plans in, research drafts graded, presents wrapped, etc. My husband had encouraged to get in bed earlier, but I wouldn’t listen. I had to do everything, right? It wasn’t just school stuff. I had laundry, cooking, baking, kids, packing for our trip to Tennessee to see my parents before Christmas, and why would I want to ask for help? I had pushed my devotional far back in the shelf, forgetting about only doing what I could. As we neared home, I fell asleep. I crossed left of center and woke up with my van facing square at an oncoming mailbox. I jerked the wheel in time to (mostly) miss the mailbox. I hit it with my mirror, shattering the glass. It was only a mirror I lost, but seeing my two little boys’ shocked faces in the back seat reminded me of what I could have lost that day. So, my New Year’s Resolution for 2018 is that I will “do what I can,” and I will leave the rest in God’s hands. I may disappoint people, may cause others to see me as an “undedicated” Christian or teacher. I may even get reprimanded by some for not meeting deadlines. I may have a dirty house (I will. I’m sure) or a basket of laundry that needs folded (or 2). I may not be able to create wonderful dinners or lesson plans that will award me Teacher of the Year, but I will do what I can to take care of my family and to serve the Lord. I may not be able to provide world peace, but I can get up 30 min. earlier to provide a more peaceful morning for myself and my boys (My husband has just fallen over in shock.). I may not be able to hit a home run in every subject I teach for the day, but I could pick one lesson and make it memorable for my kiddos. Do you see how doable this is?! We can do it! We can’t do it all, but we can do something, right?! Do what you can and let the Lord work in and through you. 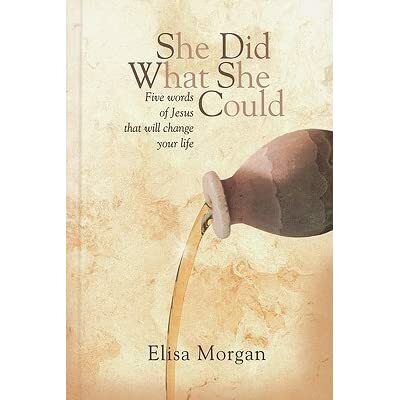 I encourage you to read She Did What She Could, but if you aren’t able to, at least read Mark 14 and determine to do what you can to serve the Lord. In the next few weeks, please share any any opportunities you may have to do what you can for the Lord and for others. I would love to hear how the Lord is using you. You can post your comments on this blog or in the comments on my Facebook Author page. Also, make sure you sign up for my newsletter. I just sent out my December issue yesterday, revealing some exciting news about the sequel to A Light in Bailey’s Harbor, A Light in Cana. Click here, if you are interested in signing up. If you’ve not read or reviewed A Light in Bailey’s Harbor, please click the picture below for more information. Have a blessed New Year’s! Enter for a chance to win over 20 eBooks!! There’s no catch, and everyone will receive something just for entering. My publishing company, Mantle Rock Publishing is having a holiday event, and you are invited! It will only take a few minutes of your time. Just click the picture that says “Enter to Win,” and you will be redirected to Mantle Rock’s page. When you enter your name and email address, you will be registered to win over 20 eBooks, including mine, A Light in Bailey’s Harbor. Even if your name is not chosen for the eBooks, you WILL still receive freebies from the authors who are participating! So, it’s a win, win! The contest ends on Tuesday, December 12th, so enter now! Well, it’s official! I had my first library book signing yesterday evening. It was a great experience and encouraging to have, among the group, a couple of teenagers. One of them was a 15 year old girl interested in writing. As I looked at her, it was amazing to think that I was about her age when I began writing A Light in Bailey’s Harbor. Time sure does fly! I’m thankful for my family who came and supported me, husband who herded the kiddos, and for 2 wonderful surprise guests! I had just started speaking about my inspiration for writing my novel–how my best friend, Alicia, and her family took our family on a trip to Bailey’s Harbor, WI, where I fell in love with Cana Island Lighthouse. Just at that moment, Alicia and her mom (Mama Debbie) walked in the back door. I immediately teared up and couldn’t talk for a few minutes (and I’m definitely NOT a pretty crier), but after regaining my composure, I was able to introduce the group to the very people who provided the inspiration for me to write A Light in Bailey’s Harbor. Bring money to make change–guess that shows how sure I was about selling my books. Hopefully, there will be more book signings in my future and more books to sign. One more friendly reminder to please, please review A Light in Bailey’s Harbor on Amazon.com. 1.Just click the “amazon reviews” icon below, and it will take you to Amazon.com. 2. Scroll down to “Write a Customer Review.” Thanks! Can’t believe I’m announcing this, but I’m having my first public book signing for my novel, A Light in Bailey’s Harbor, on Monday, August 8th at 6:30-7:30pm! One last thing, if you’ve read A Light in Bailey’s Harbor and haven’t reviewed it, please take a minute and review it on Amazon! That would greatly help me out. Just click below, and it will take you directly to it! What an awesome privilege I had last week to be a part of a FaceTime, book club discussion in DeLand, Florida. It really does amaze me that a group of 12 ladies would set aside an evening to discuss a book that I’ve written! I still have to pinch myself on that one. The ladies were all calling the characters by name, asking to know what would happen to them in the next book. They spoke of each character like they were a neighbor or a friend from church. I had to keep my mouth from dropping open. The most amazing part of the night was that after answering questions about why I included various characters, the struggles of their faith, and the way the Lord worked in their lives, I found out that this book club was not an all-Christian group. It had never occurred to me that my book would reach non-Christian readers. What an exciting moment the Lord provided to encourage these women and to plant seeds. I now have a far greater reason to continue to work on the sequel. I’m so thankful for this opportunity and pray the Lord will continue to use A Light in Bailey’s Harbor for His glory.